While Travertine is durable, it is also a natural and porous stone, which makes it especially vulnerable to staining. Travertine requires sealing to protect it from absorbing liquids and receiving superficial scratches. A sealant will not protect against all damage from acidic substances such as soda, wine or harsh chemicals found in cleaning products but it will reduce the impact and extend the longevity of the stone. The sealant acts as a barrier between the surface of the stone and any exterior influences that may come into contact with it to keep your Travertine beautiful for years. 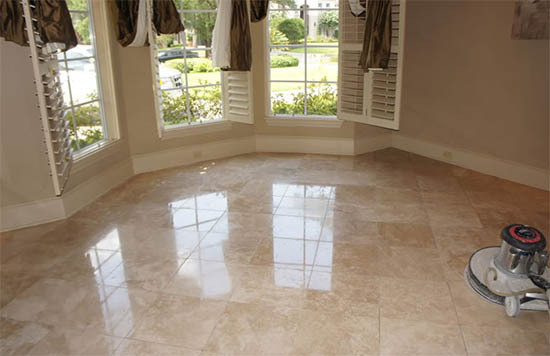 Often times, Travertine is sold with a thin coating of wax. In order to seal the travertine this wax layer must be removed from the stone. It should be noted that any wax remover used on Travertine must be free of all acidic ingredients to ensure the Travertine is not stained or damaged in the process. After ensuring all wax has been removed the stone must be thoroughly cleaned. Dry cleaning the Travertine with a rayon mop or static pad to remove all dirt and dust is crucial. Then it is recommended to go over it again with a hard surface safe vacuum. It’s important to get the Travertine as clean as possible while dry so when damp the grime doesn’t permeate the stone. Once the Travertine has been dry cleaned a specialized neutral or alkaline cleanser made for natural stone can be used. Dry the surface with a cotton or microfiber cloth and then allow the stone to breathe so the remaining moisture can evaporate. During this time restrict contact with the stone as much as possible. When the Travertine has sat and dried it is ready to be sealed. With a soft cloth or lambswool tool the sealer must be spread evenly over the Travertine. Working in small sections and from the farthest point of the room is recommended. After 30 minutes to an hour apply a second coat the same way. Remove the excess sealant and buff the rest out. It is important once the stone has been sealed and buffed to keep them untouched from furniture or foot traffic for 48-72 hours. Before moving things back into the room test the seal by sprinkling a few water drops on the Travertine. If sealed properly the water will form little beads on the surface instead of absorbing into the stone.